Nigel Wright has resigned as Prime Minister Stephen Harper's chief of staff, following revelations he wrote a $90,000 cheque to repay living expenses claimed by Senator Mike Duffy. Nigel Wright has resigned as Prime Minister Stephen Harper's chief of staff, following revelations he wrote a $90,000 cheque to repay improperly claimed housing expenses for Senator Mike Duffy. In a statement issued Sunday, Wright said Harper has accepted his resignation "in light of the controversy surrounding my handling of matters involving Senator Duffy." "My actions were intended solely to secure the repayment of funds, which I considered to be in the public interest, and I accept sole responsibility. "I did not advise the prime minister of the means by which Senator Duffy's expenses were repaid, either before or after the fact," said Wright, who had been Harper's chief of staff since January 2011. He said he regrets the impact the matter has had on the government, the Tory caucus and all his colleagues. Ray Novak, Harper's principal secretary since 2008, will take over as chief of staff, the CBC's Hannah Thibedeau reports. Early on in his political career, Novak interned in the office of former Reform leader Preston Manning and then became Harper's executive assistant when Harper returned to federal politics in 2001 to lead the Canadian Alliance party. Wright is the former managing director of Onex, the largest private sector employer in Canada. Onex owns or manages companies such as Indigo, Cineplex, Allison Transmission, Hawker Beechcraft and ResCare. Harper issued his own statement on Sunday, confirming Wright's decision. "It is with great regret that I have accepted the resignation of Nigel Wright as my chief of staff. I accept that Nigel believed he was acting in the public interest, but I understand the decision he has taken to resign. "I want to thank Nigel for his tremendous contribution to our government over the past two and a half years," the prime minister said. The Prime Minister's Office had been insisting as recently as Friday that Wright had the "full confidence" of the prime minister and would be "staying on." Harper will meet with his Conservative caucus on Tuesday, one day earlier than usual, before departing on an official four-day trip to South America. He is one of three senators who have been at the centre of an external audit since December over expense claims. The former journalist resigned from the Conservative caucus on Thursday, a week after audit and Senate committee reports were released on his expenses, as well as those of Conservative Senator Patrick Brazeau and Liberal Senator Mac Harb. A Senate committee concluded earlier this month that Harb owes $51,482 in housing-related expenses, a finding that prompted him to quit the Liberal caucus and sit as an independent. The committee said that Sen. Patrick Brazeau — expelled from the Conservative caucus after he was charged in February with assault and sexual assault — should repay $48,744 in expenses. An audit is still being conducted on the expenses of Senator Pamela Wallin, who stepped aside from the Conservative caucus on Friday. 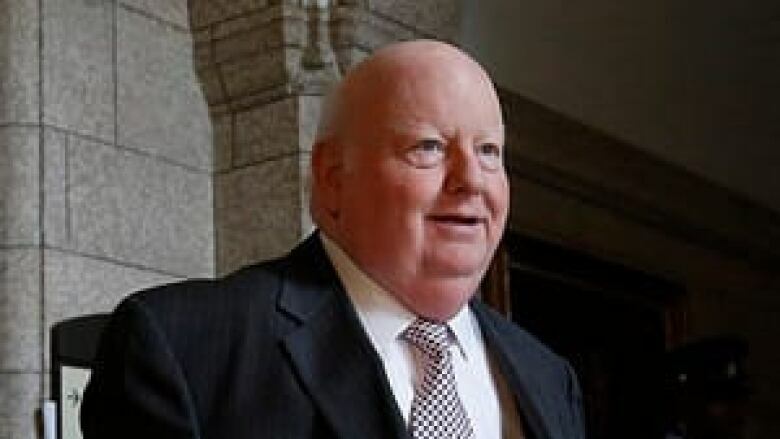 Liberal MP Bob Rae said someone needs to take a "hard look" at whether more than just ethics rules were broken when Wright wrote a personal cheque to cover Duffy's expenses. "There are provisions, not only in the Senate ethical code, but there are also provisions in the Criminal Code of Canada. People can't accept payments if you're a public office holder which have the effect of changing the activities of government." Rae said the $90,000 payment had a "direct impact on the conduct of an audit into the activities of Senator Duffy and other senators." "We know that Senator Duffy's audit was shortened, was changed, because of the fact that he made this $90,000 payment and that he made this payment because Mr. Wright gave him the money to make the payment," he told CBC News. NDP ethics critic Charlie Angus also pressed for more answers on Sunday and said the Conservatives "are now in full-out political panic" over the payment. "I think what the resignation tells us is that the prime minister is now in full-fledged damage control. They pushed Pamela Wallin off the ship on Friday, Mike Duffy went for the high jump the day before, now Nigel Wright's gone, the prime minister's taking off for Peru," he said. "Nigel Wright needs to come clean on the details of the deal he negotiated to cover up for Senator Duffy's expense claims and whitewash the Senate committee report," Angus said, adding it's important to have an independent investigation to determine exactly what happened.